Photographing a stranger can instill terror in some photographers. Ten years ago I was one of those photographers. It took the simple act of watching a friend ask to take a stranger’s picture (and the stranger saying yes) that made me realize how easy it could be….I just needed to ask. Since that epiphany I’ve come to love taking photos of people. In this post and the series to follow, I’ll be discussing the kind of people photography that I love to shoot. It is closer to street photography than it is to traditional portrait photography; a mix of the two that involves meeting strangers, making friends, and hopefully coming away with a good picture. These posts are for photographers already comfortable at approaching strangers and especially for those of you who haven’t photographed people before but want to try. I know this kind of photography isn’t for everyone, but if it tickles your curiosity, I encourage you to try taking a photo of a stranger. When I write about photographing people in these posts, unless mentioned, I’m exclusively referring to situations where I’m using a wide-angle lens and am close to my subject (from a few feet to sometimes even inches away). I’ve not only come to love the interaction gained by getting closer, but I like the way wide-angle images make the viewer actually feel like they are in the situation themselves. Don’t you feel like you can almost hear the conversation, the laughter, and the buzz? 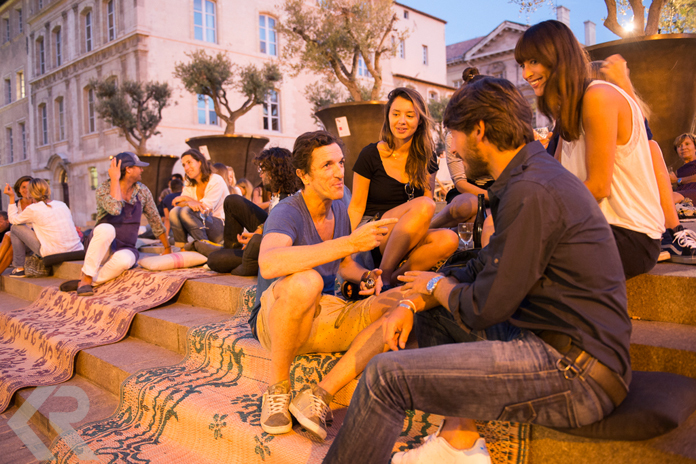 This photo takes you straight to a chill evening in Marseille, France. As a photographer I achieved that effect by actually being close to the subjects and using a wide-angle lens. Telephoto lenses are great for getting the subject closer in the frame. They can make beautiful portraits that soften the background or can be used to isolate a subject in busy scenes. But when photographers are using a telephoto lens as a crutch because they are too afraid to actually get themselves closer to the subject, then I’m no longer a fan of these kinds of lenses. Please don’t think that the person across the street won’t notice a huge lens pointed in their direction! I’ll discuss more uses for long lenses in people photography in another post, but for now let’s pull out the wide-angle and get closer. 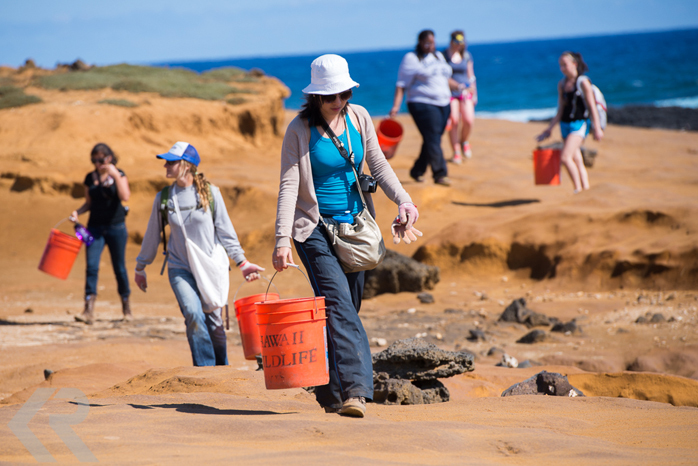 A telephoto lens is useful for compressing space and isolating an individual like in this image taken at 200mm in Hawaii during a beach clean-up during my voyage with Semester at Sea. My philosophy with taking pictures of people is as simple as the golden rule, “Do unto others as you would have them do unto you.” I figure that if someone were taking a photo of me I’d at least like to know why. And to dovetail with the sentiment above, it is much easier for someone to react suspiciously and act uncomfortably when a long lens is aimed at them rather than by being close enough to say hello. Assuming we have a shared language, I’ll tell people what interests me in taking their picture, whether that is the colors or clothes they are wearing, the light they are standing in, or the interesting thing they are doing. Also consider telling people what the photos are for. I often have the reason that I’m working on a travel story, but it can just as easily be to build my portfolio or work on my people photography. The key here is to be genuine. 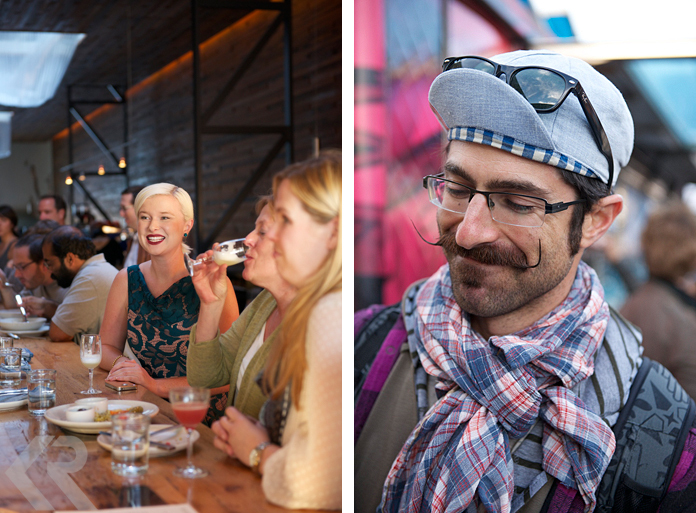 While on assignment in San Francisco, I knew I wanted to photograph both of these people the moment I saw them. Although the shot on the left is taken at 70mm from some distance, I had already spoken with the woman so she knew what I was doing. 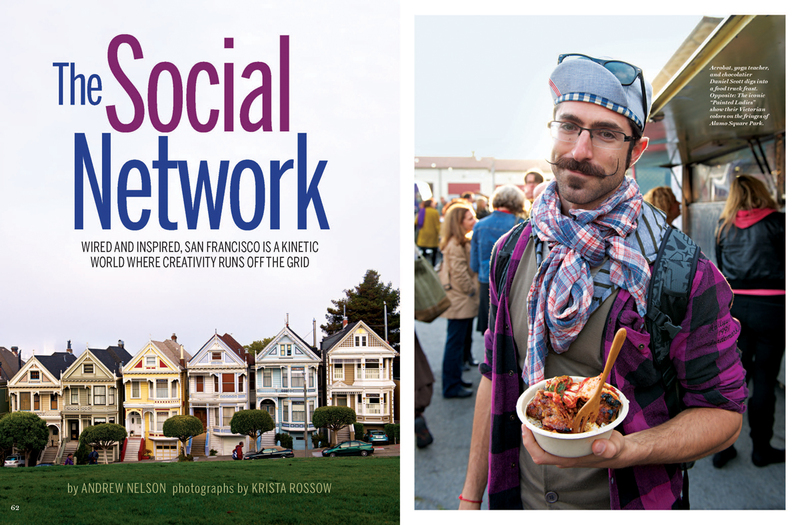 When this man on the right crossed my path at a food truck event at Fort Mason, I chased him down and told him how fabulous he looked with all of his colors and patterns. Then I took this portrait at 50mm on my 24-70mm lens. In the coming posts I’ll cover how I approach people, putting your subject at ease, model releases and paying for photographs, lens choice, and much more. Please leave your own tips on photographing people in the comments below. In September of last year I was given the opportunity to photograph a feature story for National Geographic Traveler magazine. I was thrilled to get out from behind the photo editing desk and head back to my native West Coast to explore San Francisco with camera in hand. Half a year later, the results of that assignment are hitting newsstands today. For about a week, I chased sunshine and learned to embrace fog. I drank so much good coffee. I ogled farm-fresh produce and delectable dishes….and sometimes got to eat too! I started (and ended) days in a fleece and stocking cap and was basking in the sun by mid-day. 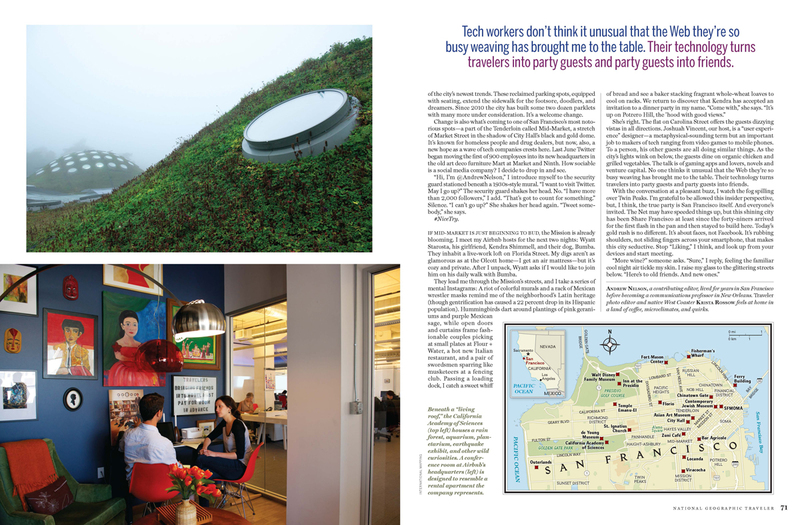 I slept in a live-work warehouse, a cozy inn tucked into the Presidio, and a funky downtown hotel. 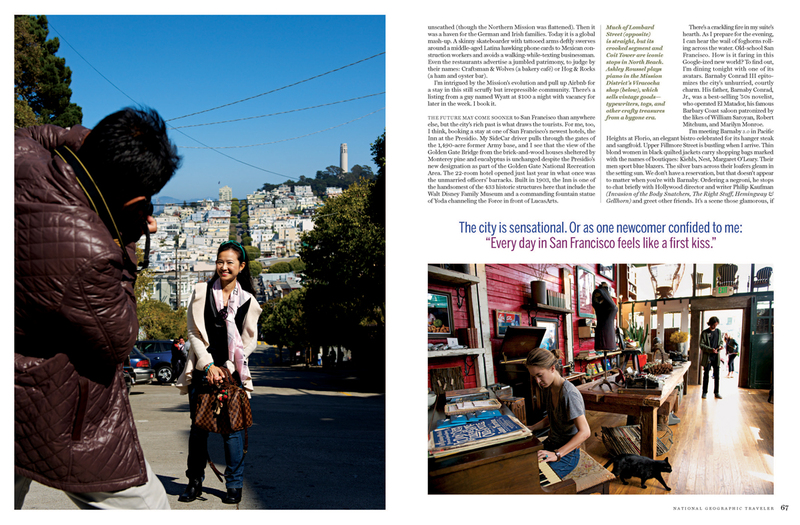 I photographed in parks, parklets, and on top of gigantic living rooftops. I rode cable cars and rubbed elbows with tourists on Lombard Street, all of us clicking away with our cameras. And on my last night in the City by the Bay, I sat in Corona Heights Park and watched the fog roll over downtown, the sky turn pink, and the city’s lights come on and sparkle. But what I enjoyed the most during this assignment was the people that I met along the way; like Daniel Scott, the yogi-acrobat-chocolatier I stumbled upon at an Off the Grid food truck round-up (and who ended up full page on the opener of the story), and Chan Quach, a local elementary school teacher who flies his two pet macaws around Mission Dolores Park on occasional evenings. I talked with crab fishermen while patiently waiting for the tip of the Golden Gate Bridge to emerge from the fog, met a former ballerina stretching in Alamo Square Park, photographed a man taking his grandson on his first cable car ride, learned all about coffee roasting from the master roaster at Sightglass Coffee, and met so many others that I’m grateful to for taking the time to tell me their stories. 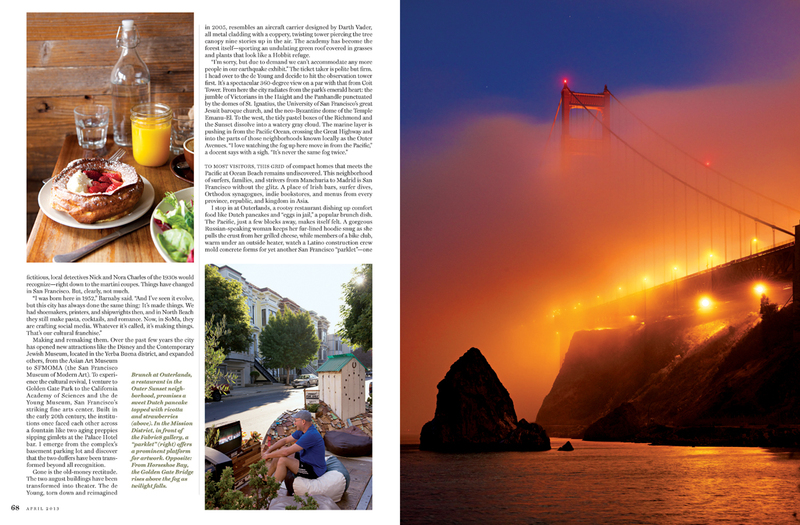 To read Andrew Nelson’s wanderlust-inspiring story and see these photographs in print, head to newsstands today to pick up the April 2013 issue of National Geographic Traveler. The issue is also available on the iPad and to get my behind-the-lens perspective visit Traveler‘s website to click through an extra photo gallery. 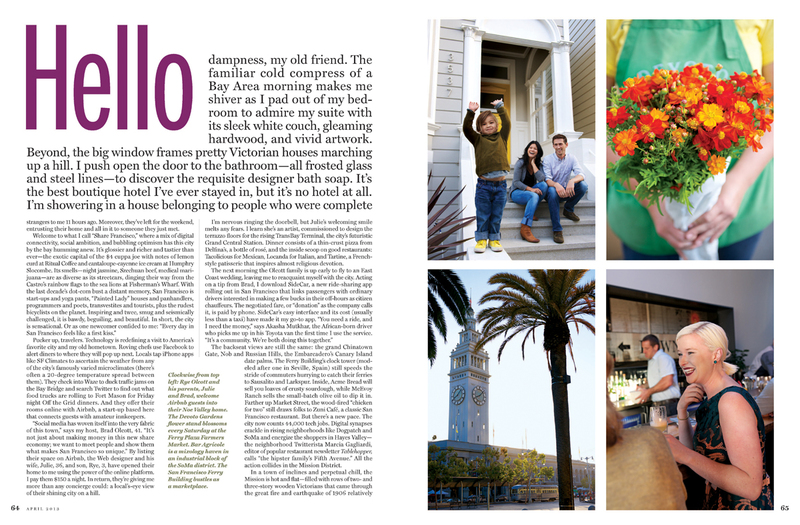 Thanks to Andrew Nelson for taking us all to San Francisco through his words (and for his great taste in cities), to George Stone for his edgy editing, to Dan Westergren for sending me to California, to Leigh Borghesani for yet another beautifully designed feature, and biggest thanks to Carol Enquist for her expert photo editing. Now, how do I get back to San Francisco?